When Bob Kaufman founded the company in 1991, he knew that making giving back a part of the Bob’s culture was the right thing to do. A staple in each Bob’s Discount Furniture store, the Bob’s Café is more than just free goodies and gourmet coffee, it’s also one of the ways that Bob’s gives back to the community. Each Café participates in Bob’s Café Collections for a Cause, a program in which donations from customers are collected in store, matched 100% by the company, and donated to a different charity each quarter. This program helps support organizations including the Special Olympics, Autism Speaks, Alex’s Lemonade Stand Foundation, and the Pajama Program. Bob’s Discount Furniture supports the mission of March of Dimes to prevent birth defects, premature birth, and infant mortality. Bob’s teams across the country partake in the March of Dimes Walk taking place in their communities along with donations to the foundation. Bob’s Outreach team and local store managers also perform at least one Random Act of Kindness each month, driven by requests from the community. 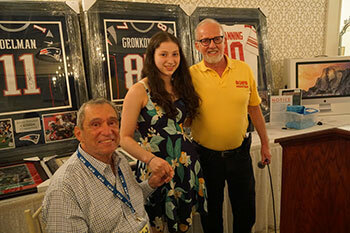 Bob’s Discount Furniture announced that its 2018 golf outing raised $635,000 for children’s charities. The money will benefit organizations selected by Bob’s Discount Furniture’s Charitable Foundation, including the Nutmeg Big Brothers Big Sisters, Camp Rising Sun, Family & Children's Aid, Connecticut Children's Medical Center, and Cardinal Cushing Centers. Bob’s Discount Furniture provides quality furniture at everyday low prices to over 100 communities across the United States. Headquartered in Manchester, CT, Bob's teams across the country strive every day to provide unsurpassed value with integrity and honesty in a gimmick-free environment. At Bob’s Discount Furniture stores and online at www.mybobs.com, customers can find furniture for the entire house. Bob's has dining room sets, living room sets, and bedroom sets along with mattresses, bedding, and home decor. For an even bigger value, Bob's has additional clearance furniture deals at the outlet, in-store and online. To learn more about Bob’s Discount Furniture, visit www.mybobs.com and follow the company on YouTube and LinkedIn. For design inspiration visit the Bob’s Discount Furniture Instagram and Pinterest.